I love this time of year! Is it the beautiful colors, the smell of fireplaces in the air, the crispness out? For me its the squash! There is not a lot of Farmers market action. There is not really a whole lot in season. Apples, squash, root veggies. But what you can do with what is available is so exciting. Some of the cooking classes offered this time of year are Risottos and Polenta, Honoring the hometown gourd (my favorite) we make everything pumpkin, without using the canned pumpkin or the spoonable pumpkin spice. Using fresh pumpkin, as with any ingredient is always best and not hard to do at all. The color let alone the flavor is so much better. Butternut squash is one of the most versatile ingredient, can be used in many places calling for pumpkin. During a private cooking class we tried one recipe of pumpkin and in the other used butternut squash, some students thought the butternut squash was milder and other students could not tell the difference. 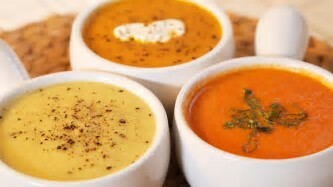 Butternut squash and apple soup is probably my favorite recipe. You can change it up in so many ways, adding cardamom, cinnamon, curry powder. Boil squash and the apple in broth until fork tender. Using an immersion blender or a stand blender puree until smooth. Return to pan and add cream, little by little until consistency is reached. Add salt and pepper to taste. Here in Half Moon Bay, home of the Giant Pumpkin Weigh Off, we are smothered in the orange gourds for 2 months. So buying local farm grown pumpkins and squash is super easy.